Every business looks out for speedy & genuine methods to engage the users with the brand. According to the Gartner, “Chatbots will power 85% of customer service interactions by the year 2020.” Therefore, Teplar's chatbot application development solution provides the finest wherewithal that allows the brands to maintain their customer service department without their involvement & assistance. Our Chatbot development expertise, ensures fast & efficient route to enhance long-term customer relationship. At Teplar, we create a chatbot or build automated virtual assistants aimed at revolutionizing the way businesses interact with customers, provide automated customer support and interactive experiences through the 24/7 chatbot platform. 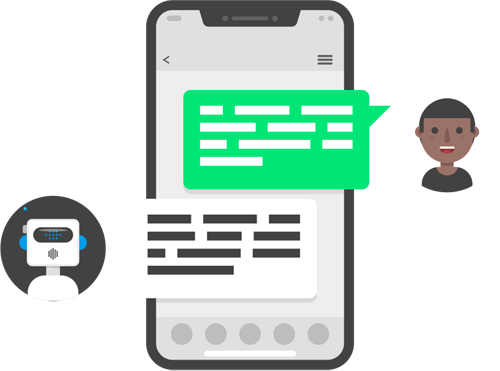 Empowered with Artificial Intelligence, Natural Language Processing, and Machine Learning technologies, we offer complete chatbot solutions for Facebook Messenger, Twitter, Slack, Kik, Microsoft Skype and much more. Whether you are looking to build customized chat bots, conversation bots, IVR bots, online chat bots, text bots or messaging bots, we provide differentiated services exactly tailored to meet your needs. Transactional chatbots are used mostly for business purposes. They are capable of storing and accessing data related to a particular company, for different functionalities. They should be able to keep track of the current customer query and reply accordingly. Artificial Intelligence-powered conversational bots from Teplar can transform customer care and digital commerce. For businesses, the efficiency and cost savings derived from the chatbots interacting with customers is highly attractive and available 24/7/365. A Frequently Asked Questions (FAQ) Chatbots are connected to a social messaging platform or to your website. Our natural language understanding (NLU) technology in combination with your historical FAQ data, allows bots to understand and answer sophisticated requests from your clients. Chatbots are able to provide automated customer service in social media, such as answering important questions, providing content and personalized offers on-demand, while inspiring engagement from social media users. We provide Chatbot solutions for Facebook Messenger, Slack, Telegram and more. Our Chatbot development provides highly intelligent and sophisticated Chatbot solutions that can be implemented into diverse domains such as e-commerce, customer support, entertainment, delivery services and healthcare. Chatbots can be implemented across different industry verticals as they can take care of multiple services like complaints, customer care and feedback, booking, searching, handling payment procedure etc. Why TEPLAR for Chatbot Development?